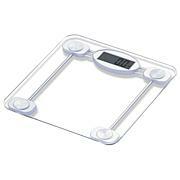 Talking scale that tells you your weight without bending over. Weighs in pounds or kilograms; capacity 550 lbs./250 kg. Place scale on a flat ground. 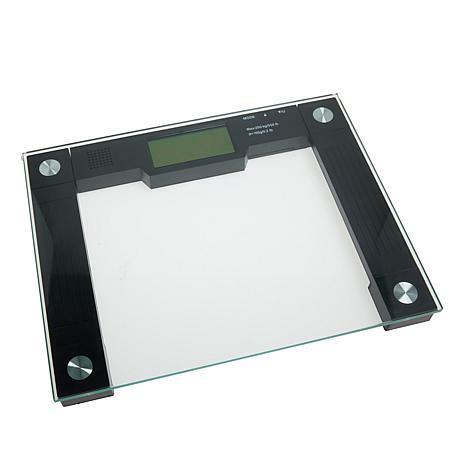 Keep your scale in a dry place to protect the electronics. Avoid extremely high or low temperature environment. 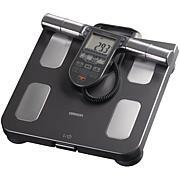 The scale is a high precision electronic product; please avoid excessive impact or vibration to the unit. To prevent scratches on the glass panel, don't wear footwear. Clean with a cloth, don't use solvents or immerse the scale in water. The product is designed for household use and should not be used for commercial purposes. Please listen to your doctor's advice. Remove the battery if the scale will not be used again for a long time. WARNING: Do NOT use the Memory Storage Talking Scale on carpet that would reduce the accuracy. Use only on dry and flat ground. - Turn scale on by pressing MODE. - Press Down Arrow/ U to set your measurement type - either kilograms (kg) or pounds (lb). - Press Up Arrow key to select user (1 or 2) and quickly double press MODE to set. - Step onto the platform, and your weight will be displayed and read out loud twice. - This weight data will be saved as the user’s latest weight. Each user can save up to 30 recordings. the best thing I have bought you do not have to see it . it tells you what you want to know ! or not depending on what it says! Accurate, attractive and I LOVE the audio. Makes it so easy when I step out of the shower and don't have my glasses on. Great product! This scale is nice and big. 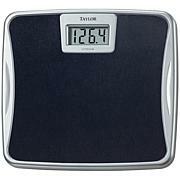 I enjoy that it talks so I don't have to wear my glasses just to weigh. This scale is the best. I love that it tells me my weight and I dont have to try to see small numbers. Its great.